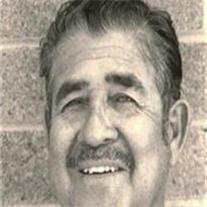 Victor A. Escobedo, 82, passed away Dec. 1, 2010 in Mesa, AZ. He was born Nov. 6, 1928 to Guadalupe and Mercedes Escobedo. He married Felipa Vasquez Dec. 27, 1946. They are the parents of George (Rebecca), Robert and Gloria; 8 grandchildren and 7 great-grandchildren. Visitation is Thursday, Dec. 9 at 10 AM followed by services at 11 AM at the First United Methodist Church, 15 East 1st Ave. in Mesa. A reception will follow the burial. Arrangements by Bunker’s Garden Chapel.